We’re nearing the end of the Summer and you’re probably all bored of the same old outdoor activities. Swimming, hiking, camping, etc. 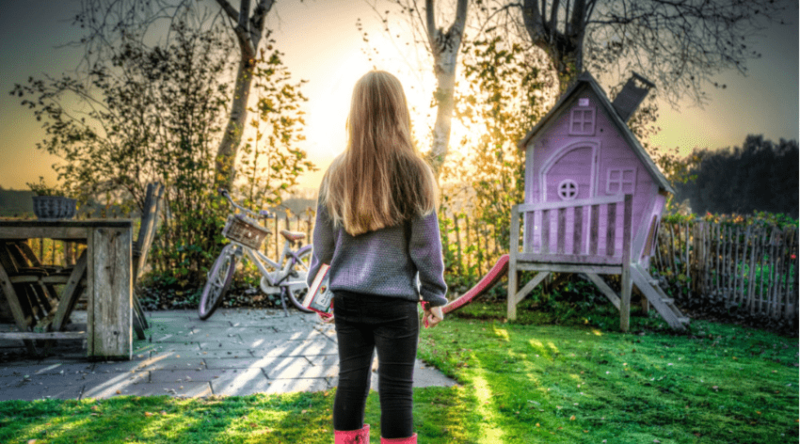 It’s getting super hot, and no one, especially the kids, wants to go outside. So what’s a family to do? It’s time to get creative, that’s what! 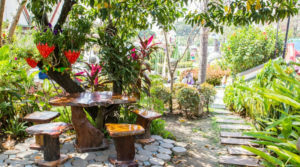 These awesome ideas should help inspire you to gather up your resources, break out those handy dandy skills and make some last minute water fun for you and the kids. 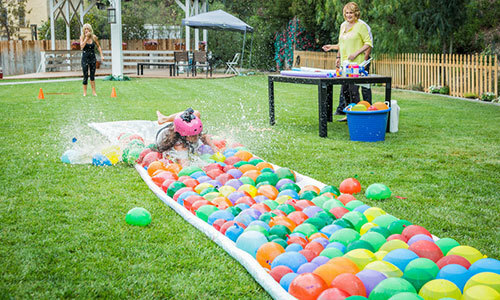 Everything from water balloon baseball to giant slip-n-slides, we’ve got you covered in this list. Now, not all of you are handy, and that’s fine. But most of these ideas are super simple and can be done by anyone. Even the children. Better yet, get them to set it up! Most of the supplies are household items or cheap things you can grab at the hardware store. All you need is a water source and away you go! So check out the list, it won’t disappoint. 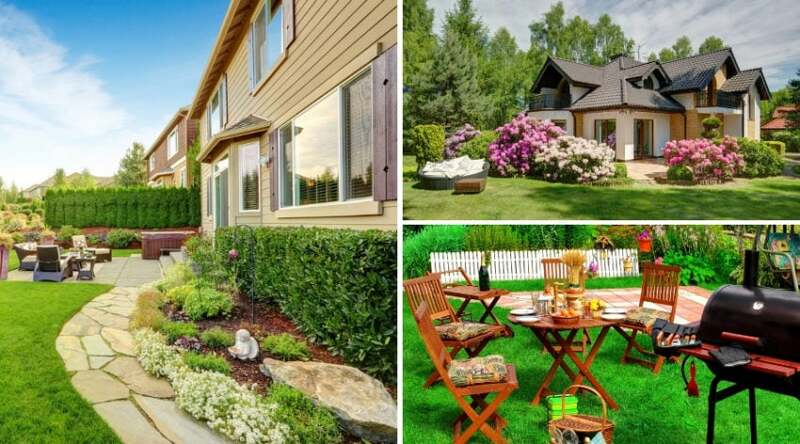 At the very least, you’ll get some great ideas of your own to keep the family happy and cool for the rest of the Summer! It’s amazing what you can do with a little bit of cheap PVC piping from the hardware store and some pool noodles. But this obstacle course/family car wash set up is such an awesome idea to keep cool this Summer. The last few weeks are all about squeezing in that quality time and soaking up the remnants of the sun. This is such a cool way to do that. 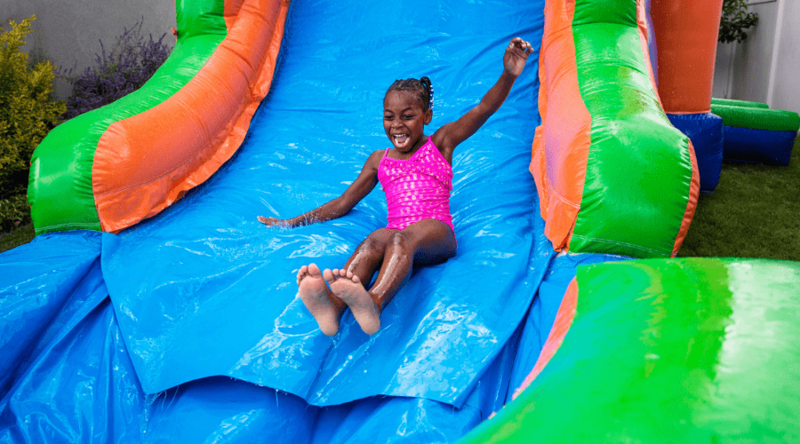 The traditional Slip-n-Slide is awesome, there’s no doubt about that. But it can get dull after the hundredth slide. Amp it up with a hoard of water balloons and you have yourself one heck a fun ride for the whole family! 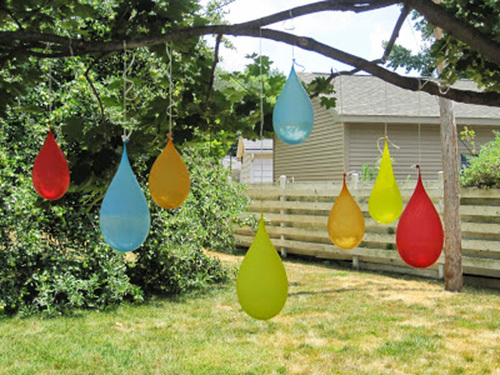 Water balloons? Fun! Baseball? More fun! 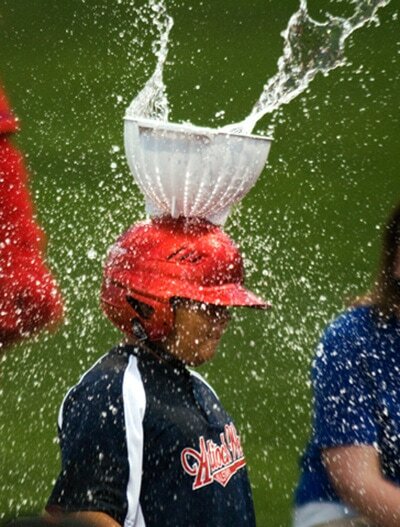 Ummm, water balloon baseball? Endless entertainment for the whole family. 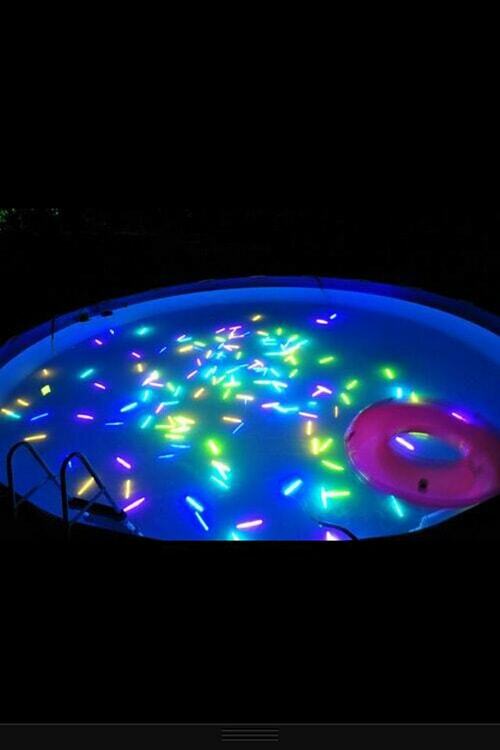 What a great way to end off the Summer and plan a big group event. 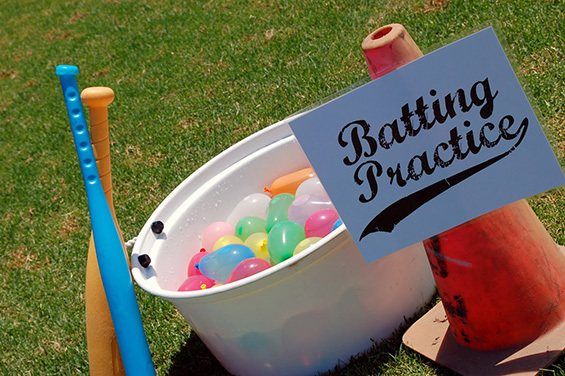 Stockpile bins of water balloons and organize an actual baseball game. You could even make the distance between bases a Slip-n-Slide so you can dive into base! Head to the Dollar Store and grab a few cheap pasta strainers and some helmets. Super glue the strainers on top and the strap them you’re your heads. 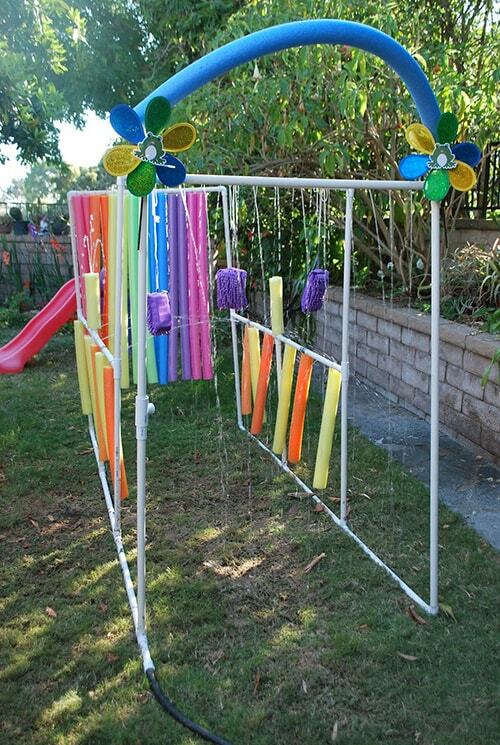 Add in some water balloons and you’ve got yourself a great game of toss and catch. It just may get a little wet. Fill them up and hang them from anything you can find. Trees, poles, swing sets, make-shift rods, whatever you can think of. The more of these water pinatas, the better. Just think of the fun you could have with the kids if everyone were whacking at these! I seriously wish my parents had done something like this when I was a kid. We had the regular water beds. You know, the ones that you actually slept on? 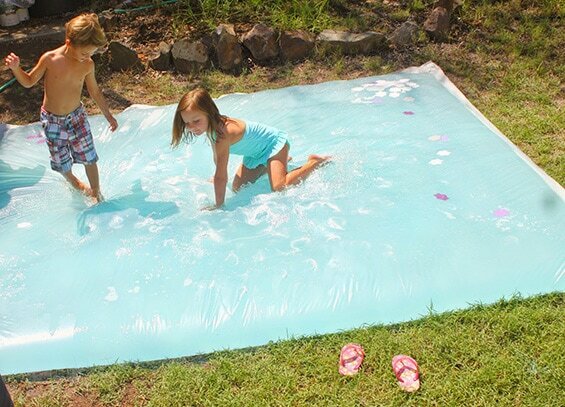 But this is a great DIY idea to have fun and keep cool during the warmer months and the kids will have a blast. If you’ve got the space, or even the option to rent out a public area such as a park, then give this giant water slide a try. You can get the massive roll of plastic from your local hardware store or buy online if you plan ahead. Just set it up with a sprinkler or near a water source and you’ve got a recipe for fun…or a trip to the ER. Either way, you’re in for an experience. Holy hay bales, batman! This is genius! 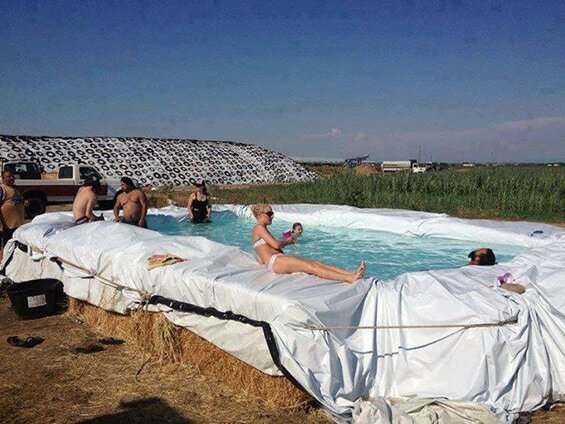 You’d need a nice pile of bales but if you have the access to them then this DIY swimming pool is perfect and large enough to invite half the town into. Easy to setup, and easy to take down. That makes it ideal for big events or family gatherings. Oh, time to get Dad back for all those water balloons, right? 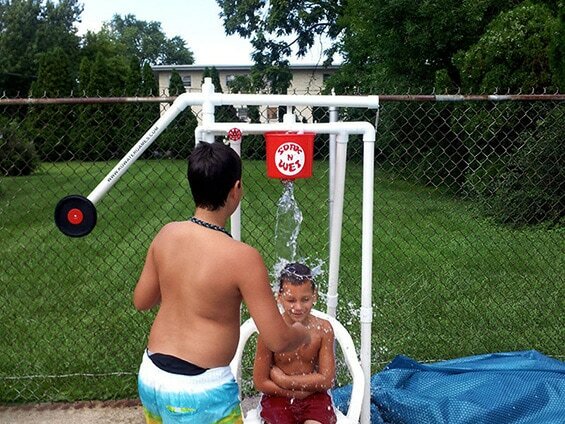 Stick him in this DIY dunk tank made from PVC pipes and some buckets. Better yet, let everyone have a turn and you’ll all keep cool this Summer. Also, a side idea for this device, it would be great for community fundraisers. Just a thought. Don’t have a sprinkler? No problem! All you need is a 2L pop bottle and some waterproof tape. 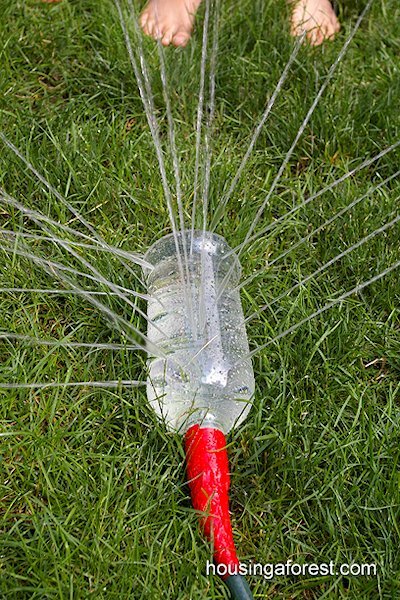 Poke a few holes in the bottle and attach to your hose for hours of water fun for adults and the kids. The adult may even love more than the little ones. Even better! 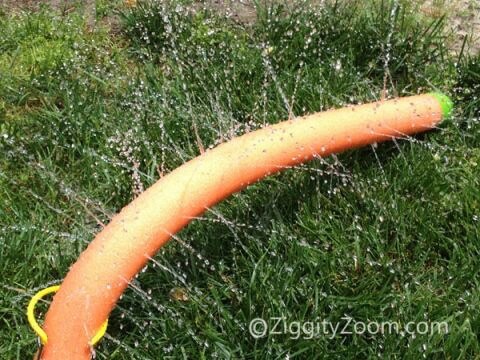 For more range and water sprinkling, try this DIY pool noodle sprinkler! You can lay it on the ground or hang it from a tree. Either way, fun is to be had. Move over, it’s my turn! Oh, yes. This must be done. 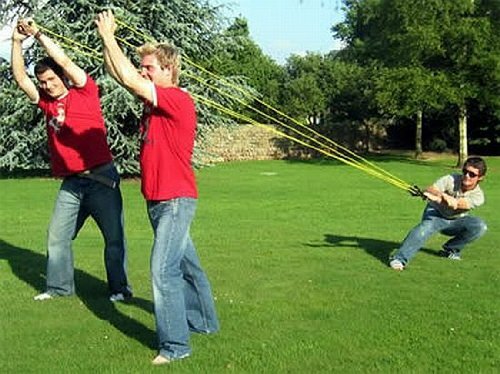 You can’t let the Summer slip by without having an epic water balloon battle using sling shots. A great way to keep cool, but also fun for he parents to get involved and play with the kids. Take it one step further and invite the neighbourhood kids over for one intense battle. Cut a hole in some pop bottles and strap them your heads. 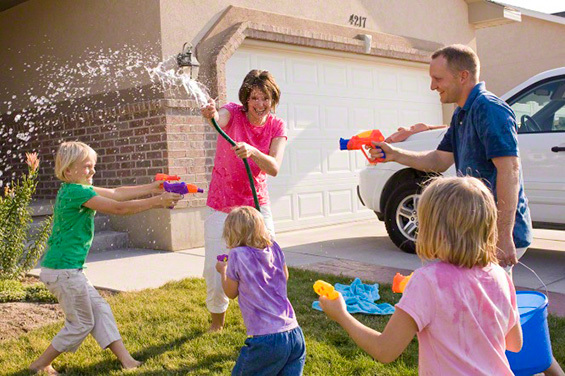 Divide into two groups and have a round of target practice with water guns. 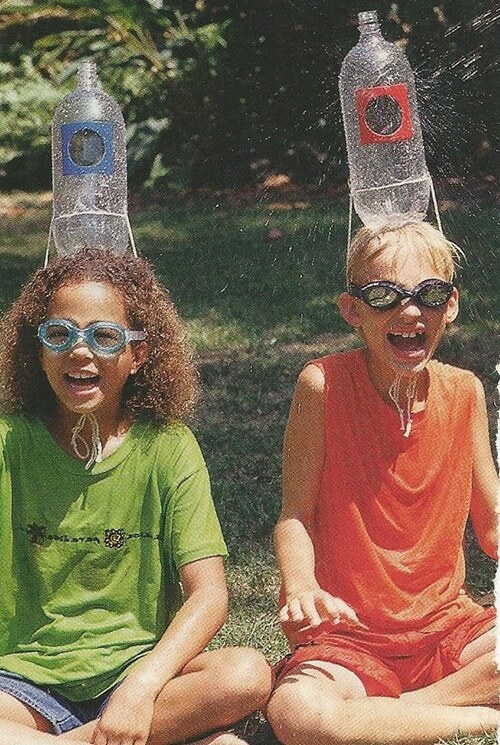 Endless hours of fun, and also a great way to get soaked. Which normally wouldn’t be a good thing, but during these hot months, it’s a welcome feeling. Okay, we can’t have a list like this without one epic water gun fight. Load them up and head off to the park for a huge battle. If it gets too hot, you’ll be taking the hit for others before you know it. Not only is this super fun for kids, but it’s delightful for parents to chase them around with water guns. I hope these awesome ideas will help you and the family stay cool and entertained this Summer. 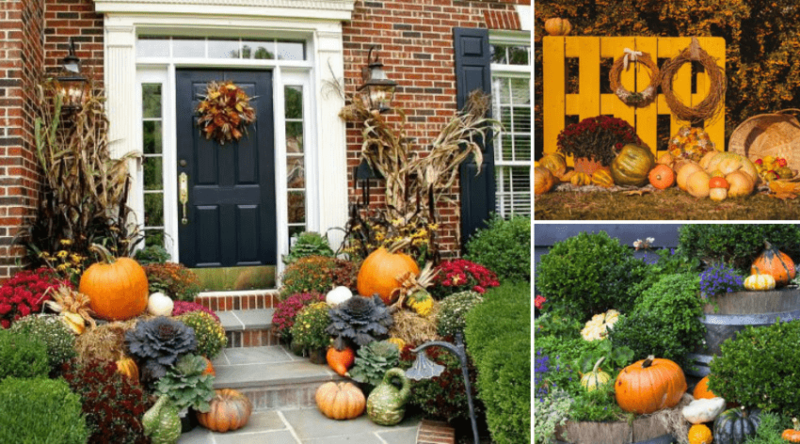 Most of these can be DIY projects if you put your mind to it and get crafty! Comment and share which ideas you did and feel free to suggest your own! 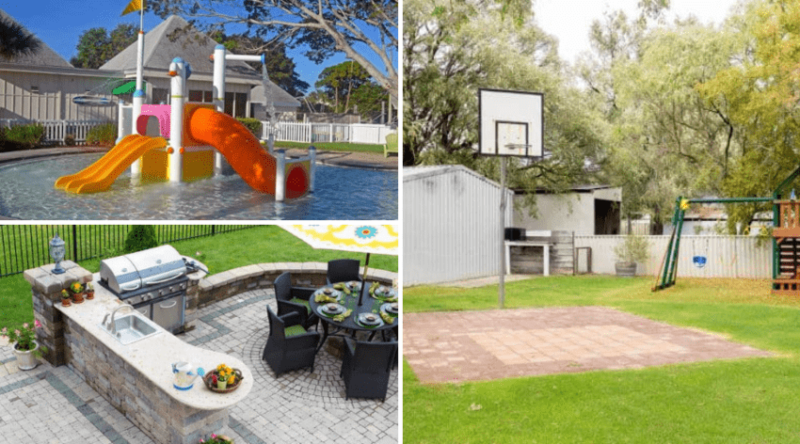 *You might also like: 35 of the Best Backyard Court Ideas: #27 IS PRETTY COOL!